Yes, we are still cleaning out Susan’s old house. Mostly it’s all books now, so it should go fairly quickly and she will be all packed up. This week we decided to take a few days off and have some fun. 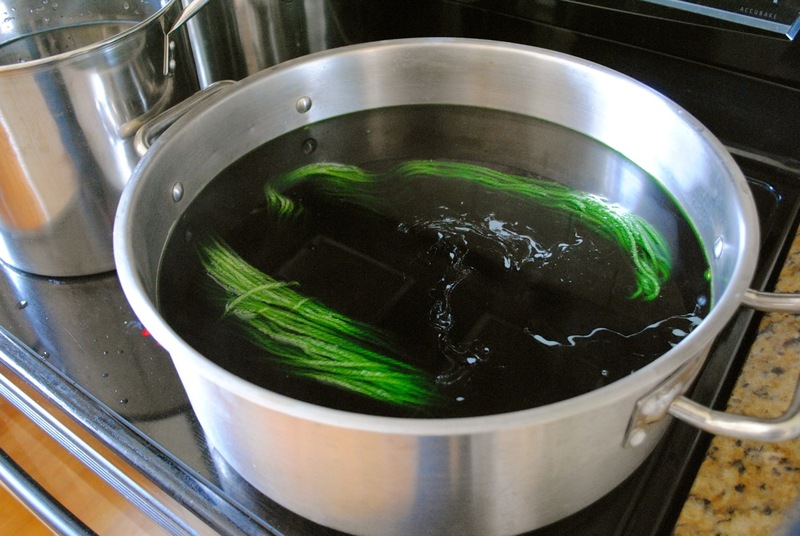 We spent a day out at Ikea (Neve and Maddie are smitten) and we spent a day dyeing yarn and hair. While they were waiting, the girls put on socks and sprayed some pledge on the floors. 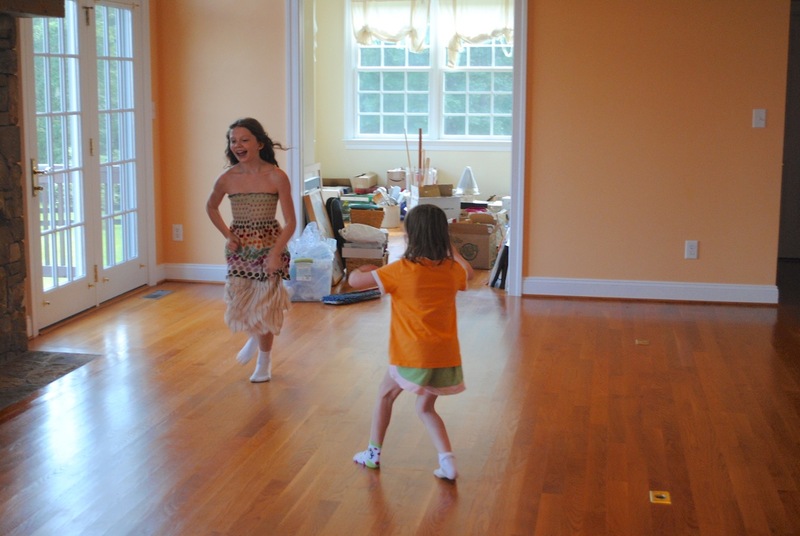 Clean floors and worn-out kids is a great combination! 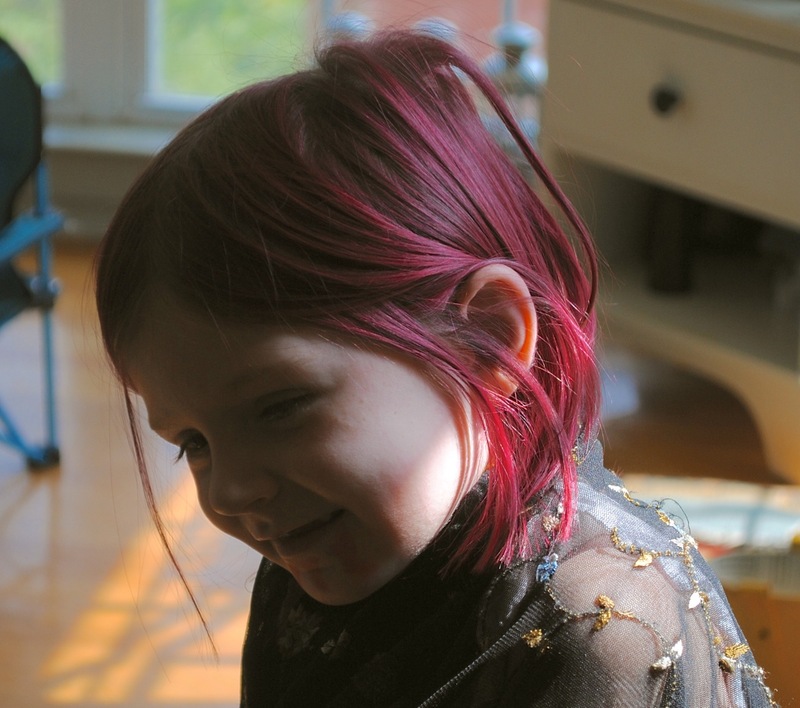 It took two tries to get Oona’s hair pink. That’s the beauty of homeschool. My kids can have crazy hair. Susan and I worked on the colors for share yarn (they turned out GORGEOUS!) while Maddie worked on the kids’ hair. Neve wanted to be “ginger” so we put orange highlights in. Oona of course chose pink. The colors are a demi-permanent, so they wash out after a few shampoos. 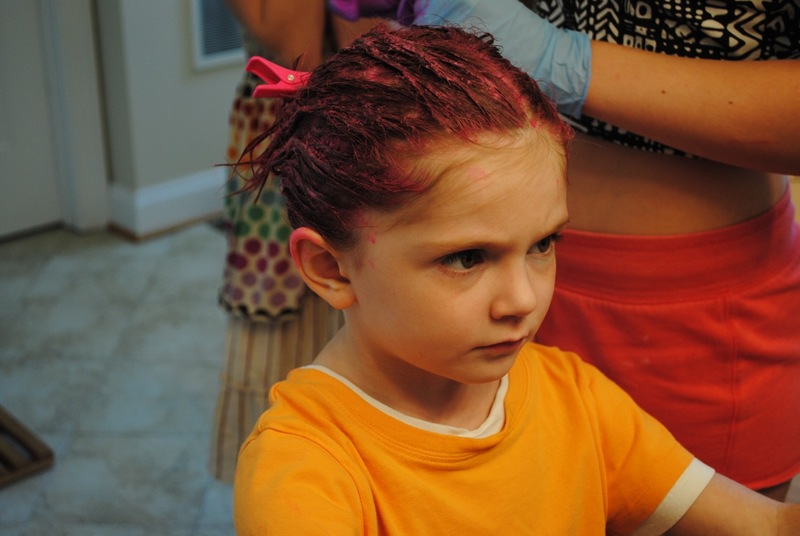 I have never seen Oona so patient as when she was waiting for the color to do its work. More share color preview. The final color is sooooo much nicer and richer than this. 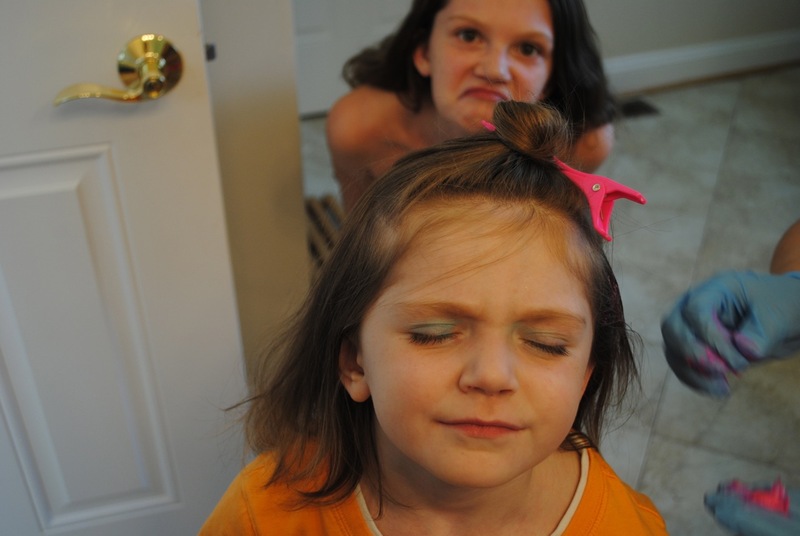 After the first attempt at Oona’s hair was a total bust we had Maddie try again a few days later. The result? A super happy Oona who couldn’t stop jumping up and down and exclaiming her love for her hair. She’s decided today that she has vampire hair; hence the red on her chin (it’s fake blood). Yes, my kids are already looking forward to Halloween, and for once I am starting to feel the excitement, too, because IT’S SEPTEMBER!!!!!!!! 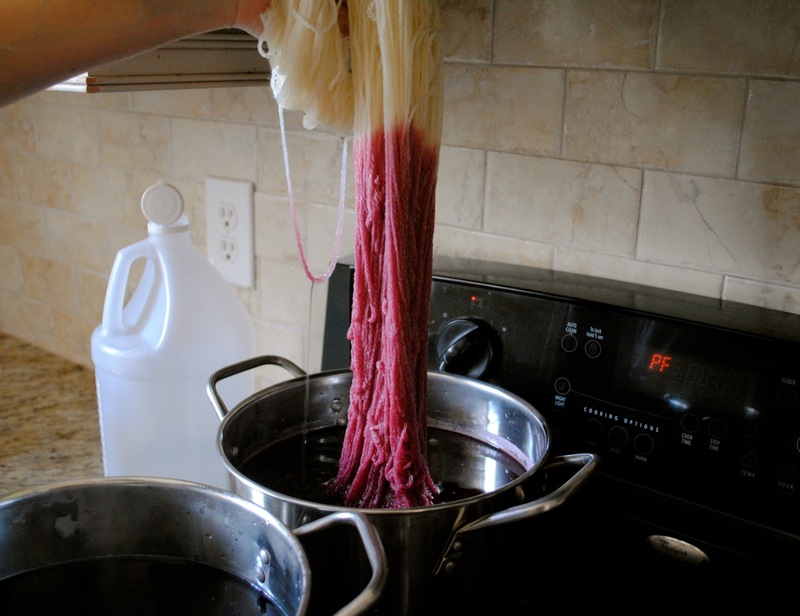 This entry was posted in Kids and tagged Homeschooling, Knitting, Seasons. Bookmark the permalink. Oh my, my daughter would LOVE some blue hair but she has light blonde and I’m terrified it would never come out haha. Would it? It would probably fade pretty slowly on light hair. There are some colors out there you can get that only last 6 washes or so.